I’ve always loved croissants and pastries in all sorts of shapes, tastes and forms. 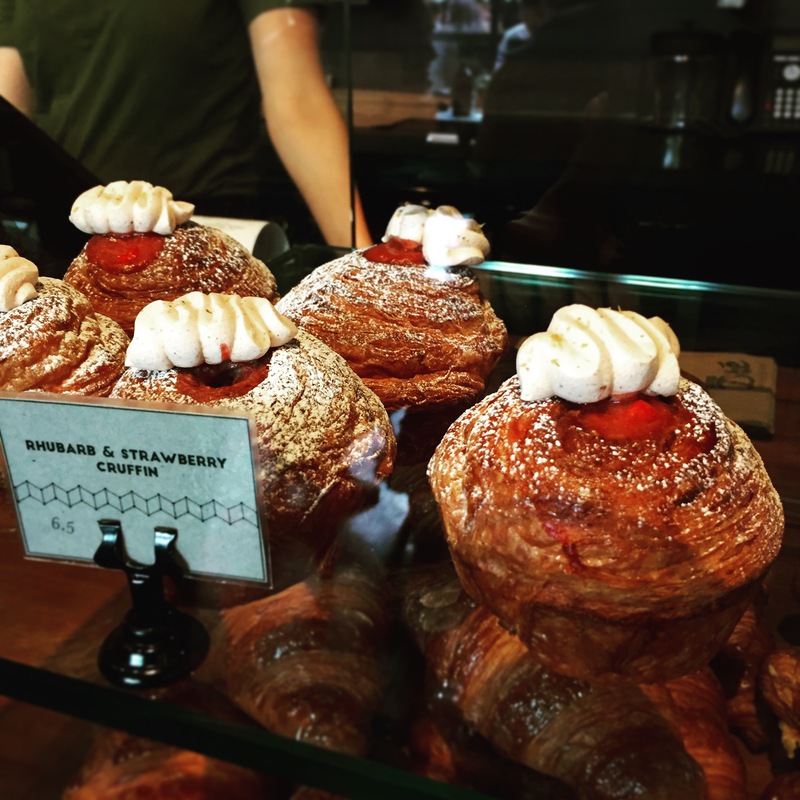 So I was simply ecstatic when I found out that different hybrids of croissant are now occupying a number of Melbourne patisseries’ cabinets! Pastry chefs are expanding their repertoire by combining the best of two pastries into one – simply genius! Today I’m posting about my croissant hybrid craze from last Saturday – a cronut from Rustica Sourdough Bakery and cruffins from Aunty Peg’s and Chez Dré. Cronut, a croissant-doughnut hybrid, was invented by Chef Dominique Ansel in New York City. The cronut, like a croissant, has multiple buttery and flaky layers. It is deep-fried, filled with custard and glazed with icing just like a doughnut. Whilst I haven’t had the opportunity to try the one in New York City yet, the ones in Melbourne have definitely lived up to my expectations. 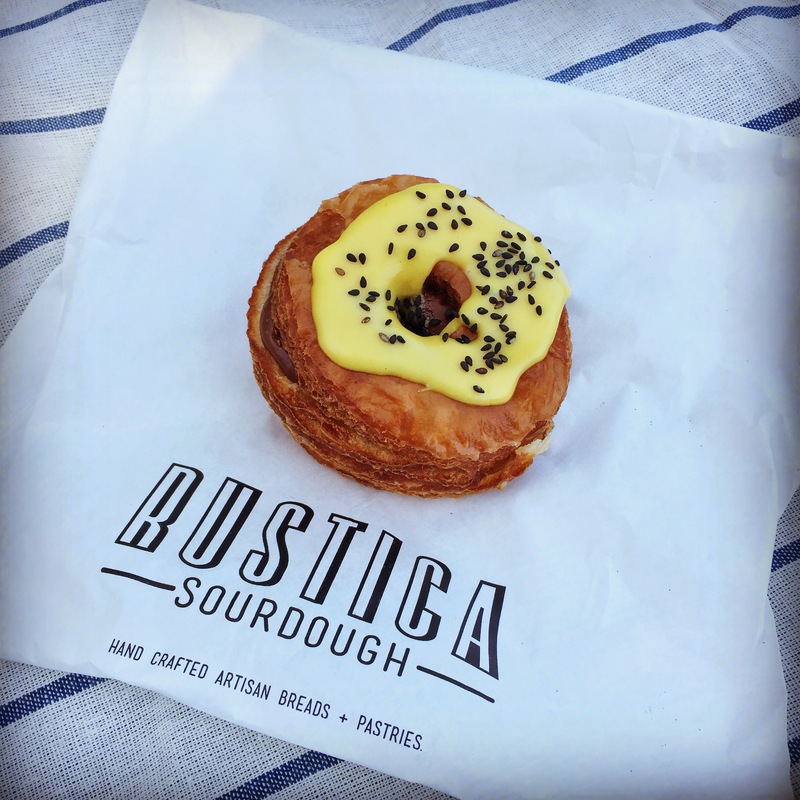 This is Rustica’s passionfruit and milk chocolate cronut. The texture is on point – imagine a deep fried croissant, with a flavourful custard and sweet milk chocolate ganache blending well with the tangy passionfruit. I’ll definitely return to try their other flavours. 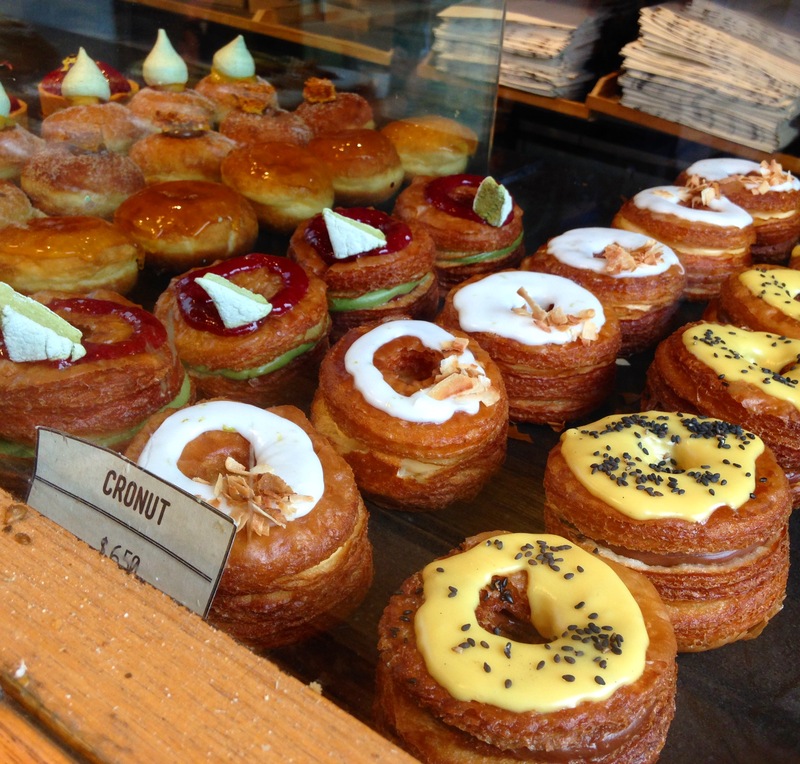 Check out these cronuts from the Rustica’s store! Don’t they look irresistible? Cruffin, a croissant-muffin hybrid, is first known to be created by Chef Kate Reid of Lune Croissanterie in Melbourne. The croissant dough is baked in a muffin mould and filled with cream, custard or jams. This is Chez Dre’s rhubarb and strawberry cruffin. The texture is a little denser than a classic croissant given it is baked in a muffin mould but it is definitely still flaky! It is filled with sweet rhubarb and strawberry compote. This divine looking pastry is Aunty Peg’s hazelnut cruffin. This cruffin is slightly different to Chez Dre’s version as I thought there are two-parts to its texture. At the top it is super-flaky just like a croissant and at the bottom it has a denser, more muffin-like texture. It is filled with light hazelnut cream and topped with glazed hazelnuts. If you prefer a more doughy pastry, you may prefer Aunty Peg’s. 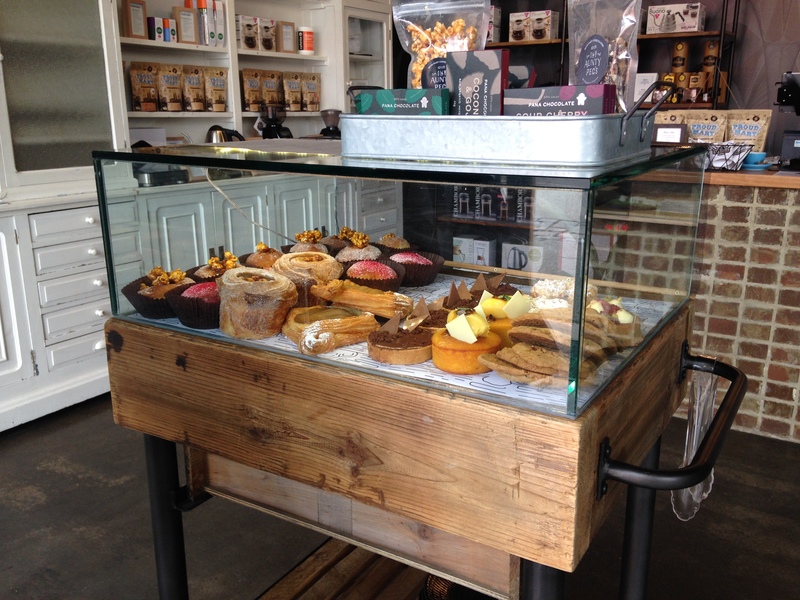 Check out their cool trolley beautifully displaying a selection of pastries, baked in-house in the kitchen upstairs! On a side note, Aunty Peg’s has one of the best cold brews in Melbourne, you must try it! Cronuts and cruffins have now become the must-haves with my coffee. 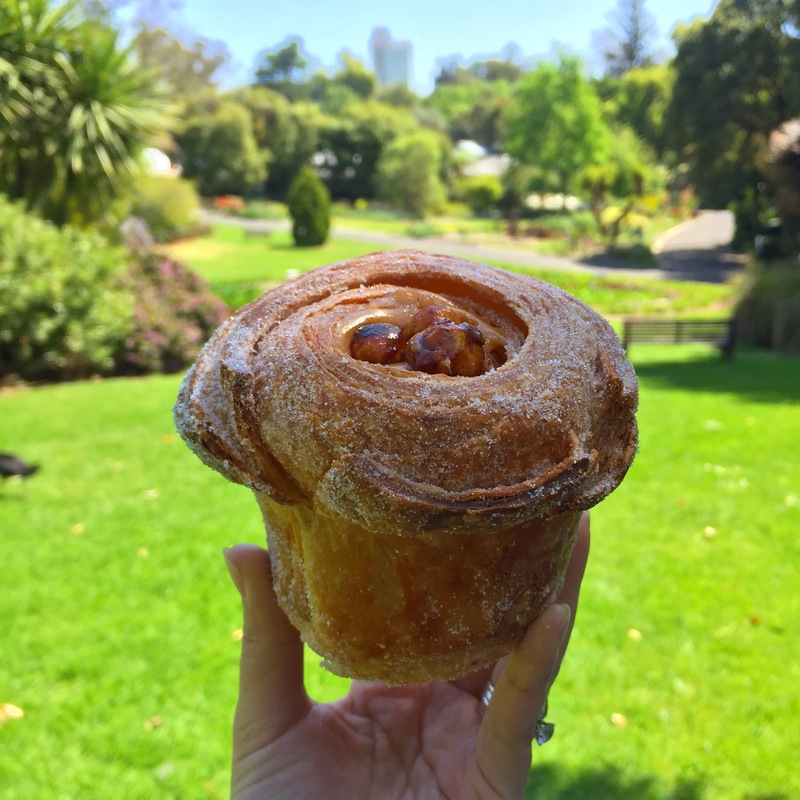 As spring is here and summer just around the corner, these pastries are great for picnics at one of the many beautiful Melbourne parks! We had our picnic at the beautiful Royal Botanical Gardens. I am not counting my calories as I plan to continue my croissant hybrid craze and taste these hybrids from other Melbourne patisseries. Next up, Lune Croissanterie and Agathé Patisserie! My timing hadn’t been good (not early enough!) in the past so wish me luck for my next visits to these stores. Interestingly I’ve read about the cragel in New York City, a croissant-bagel hybrid, but I have yet to see one in Melbourne. Which pastry chef do you think will introduce the cragel to Melbournians? Thank you so much John for your kind words! That is very encouraging! I’m glad you found it valuable!